Cryo Chamber is becoming known for their collaborative work more and more with each passing year. While some albums, like the Lovecraft series, are truly collaborative, in the sense that every piece of music has 2 or more artists working on it, albums like the Tombs series and Locus Arcadia fall more into the realms of compilation. But, the thing that keeps these more compiled works coherent and centralized is their strict adherence to themes. On Tomb of Seers, once again Cryo Chamber proves that they can step outside the normal boundaries and still manage to release a brilliant album which receives as much love from new fans as it does from those who have been following the genre for the last 25 years. Tomb of Seers is the second installment in the Tombs series. On Tomb of Empires we were first introduced to Council of Nine, a brilliant Californian artist, who has a mastery of drone-work. His style of keeping the track subtle, while simultaneously filling it with a plethora of soundscapes, was first put to the test here. Alphaxone had contributed some of his most praised tracks to date on Tomb of Empires. As usual, the album art was spot on, bringing a sense of the fallen ancient civilizations that the artists wanted to portray. Tomb of Seers seems in part to keep that same sense of ancestral gravity. As this is a series of Tombs albums, it makes sense that the sounds would lend themselves to some ancient time period, long forgotten and erased by modern humanity. 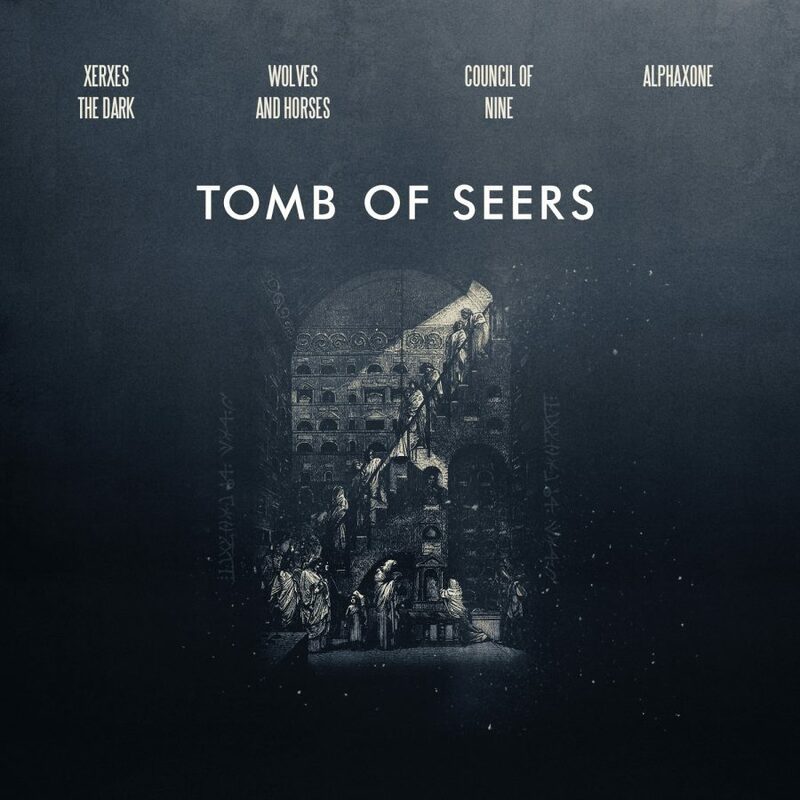 While Tomb of Empires focused on the loftier goal of bringing full civilizations into the mix, Tomb of Seers is able to focus on a more specific concept, that of the seer. The seer is something like a fortune teller, but much more revered. Like the town’s shaman, or the virgin oracle of Delphi atop Mount Parnassus, the seer is able to give advice, premonitions, and warnings to those who would seek their counsel. Many religions throughout human history have found solace in the answers of their seers. While some religions, with a lack of clairvoyance, found their worshipers wandering off, in search of a more mystical and occult answer. The first track on Tomb of Seers hints at this concept. Alphaxone delivers the opener, “Witchcraft”, which is a high point in his musical career, delivering a sound that is larger than life, and truly fitting for this endeavor. As the Christians of Salem found, during their witch hunts, many people were willing to trade their very souls for a taste of occult knowledge. “Witchcraft” sets the album off as a dark and exceedingly frightful track, the gravity of which is felt in the deep bassy drones. Council of Nine continues with this nightmarish narrative on “Fallen”. “Fallen” takes the listener for a tour of the cavernous depths of some subterranean metropolis. You can almost feel the dank air as it accumulates on your skin. The vibe is equally as mystical as it is dark. Again, we hear something that is quite likely one of Council of Nine‘s best tracks to date. “Fallen” incorporates a more active use of field recordings and sacral samples than can often be found on his two full-length albums. While Alphaxone and Council of Nine seem to be honing their talents, reigning in their visions, there is also new blood in the waters. Xerxes the Dark, long-time colleague of Alphaxone, both hailing from Iran, finds himself on his first foray into the Cryo Chamber discography. His track “Ethereal” has a wondrous feel to it, with a mood that is slightly brighter than that of the previous tracks. On “Omniscient” Xerxes the Dark takes us on an aural voyage, filled with field recordings which give the album even more depth. His conservative use of drone, along with these field recordings makes it possible for listeners to close their eyes and take that aural journey into lands long forgotten, searching for answers to the age-old existential questions. A performance of this caliber is sure to increase the likelihood of hearing more from Xerxes the Dark on the Cryo Chamber label for future releases. The second new-comer to the label is Wolves and Horses, an artist who really seems to walk the tight rope between ambient and dark ambient in a tasteful and compelling fashion. “Procession”, true to its title, seems to be taking us on a journey to the oracle. A procession of believers, on their pilgrimage to the seer. Minimal use of percussion and crystalline chimes give the album its first real taste of something which could be construed as ritual ambient. Yet this is nothing like the ritual sounds of Shibalba, or even any of those legendary Aural Hypnox artists. The sound is something fresh, which seems like the darkest new age track ever written. It imbibes that same sense of peacefulness, oneness with the gods, without having a nightmarish atmosphere. We again hear Wolves and Horses on the final track of the album, “Aphelion” where they, again, take the listener on a dreamy journey toward the all knowing, all seeing, interpreter of the gods. With top-notch performances by each of the artists involved in Tomb of Seers, Cryo Chamber gives us an album which is sure to have as much of an impact as Tomb of Empires did, years before. Alphaxone and Council of Nine both present us with career topping performances, while Xerxes the Dark as well as Wolves and Horses give us a taste of where the future may lie in this dark ambient label. A label which has made monumental advancements within its short lifespan. Tomb of Seers is as potent of an album for die-hard dark ambient fans as they could ask for, while it has enough activity and breadth of styles to be a first stop for the newest wave of fans, having just fallen for dark ambient over the last year. It’s albums like Tomb of Seers that prove the wide range of formats that Cryo Chamber is willing to conquer. Never settling down, never devolving into repetition, Tomb of Seers is one more masterpiece in the ever-expanding catalog of Cryo Chamber masterpieces.